Pune never fails to surprise us and this time we found awesome in the most unexpected area of Wakad. 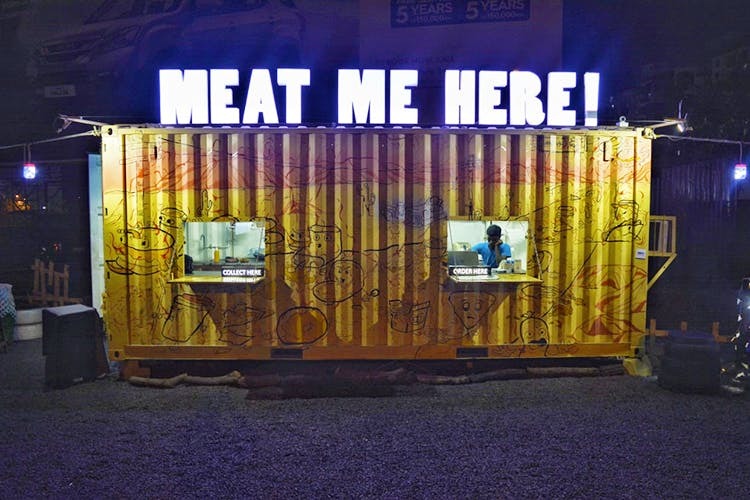 Say hi to Meat Me Here!, a shipping-container-turned-restaurant at Bhumkar Vasti that is serving one of the yummiest crispy chicken burger in town. One of the best things about the place is its super-cool ambience. Imagine flashy neon signage that screams ‘Meat Me Here’ on a quirky yellow shipping container that has been turned in to a kitchen. The surrounding area looks like an empty ground that’s been converted into an under-the-stars, al fresco arrangement with wooden tables, seats that look like tyres, bean bags, low hanging and fairy lights and a huge LED projector that shows everything from live matches to music videos. The food at Meat Me Here! is delicious, fuss-free and affordable. We loved their crispy chicken and minced kheema burger along with a side of BBQ mustard wings and the chocolate milkshake. And, here’s the best part, it all costed us under INR 500 for two. What a scrumptious deal! Ditch McDonald’s for once, and experience something unique and fun at Meat Me Here!